Actors on the stage are acting and singing. The whole sequence is accompanied with a classical orchestra or modern orchestra. 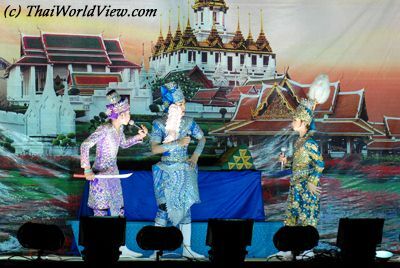 Usually, practitioners of Likay must perform the "WAI KRU" rite (paying respects to the teachers) before going on stage. The actors are dressed with flashing clothes and with brilliant stuff. Men use cosmetics. Their lips and cheeks are really reddish. 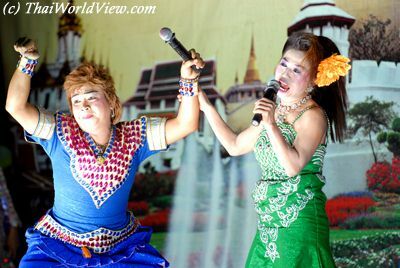 In Thailand, there is a dedicated cable TV channel for Likay performances. It is called "Rose" channel. In Central Plains area, when there are big events such as Buddhist temple annual fair or local village celebrations, a "LIKAY" troupe is often invited. 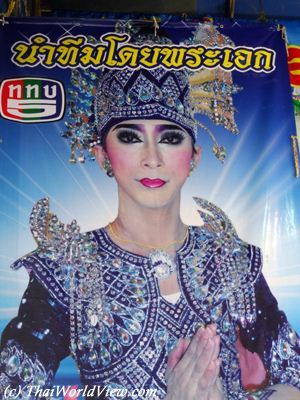 A "LIKAY" troupe is famous if the main actor (พระเอก - "PHRA EK") is handsome. Performances are always funny and often include love stories. Spectators often clap hands when an actor is performing well and then offer flower garlands to him. This skilled Likay young artist was performing in Klong Tom area in an outdoor market. A sign was indicating that any money donated will be for him to pay his school studies (clothes, book...). Mookmontri Street (ถนนมุขมนตรี) in Nakhon Ratchasima has an historical importance. It was once known as the Likay district as the whole street was occupied by more than 200 Likay troupes in its peak during World War 2. This place is also called Kollywood as a short name for Nakhon Ratchasima is Khorat. The legendary Katookong brothers (National Artist Boonyang Katookong - ครูบุญยัง เกตุคง) came to this neighbourhood. The Likay folk performances became less competitive and the number of troupes declined rapidly. It is now standing at under 20. Likay troupe performances can often be seen in big annual temple fairs. Such fairs always include various entertainments events (Likay, music concert, outdoor cinema, games, food stalls) to attract visitors. 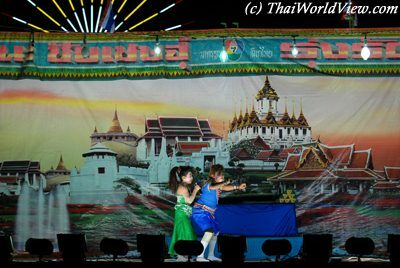 Likay is the most popular form of Thai theater and such performances can be seen at temple fairs and other special events. Special events could be a yearly house-warming ceremony in Central Plains area. The hosts is inviting a Likay troupe. The whole village can then enjoy free Likay performance. 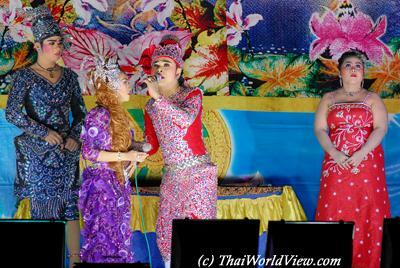 Those ladies, practitioners of Likay, are performing the "WAI KRU" rite (paying respects to the teachers) before going on stage. They are also paying respect to local deity per the request of event organiser. 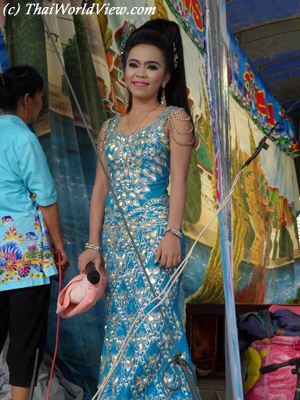 One old Thai sayings says that Thai women shall never trust boyfriends or husbands who work as policemen, boatmen, Likay performers or on the railway! ome Likay troupe do combine concert and folk theater performances on the same stage. 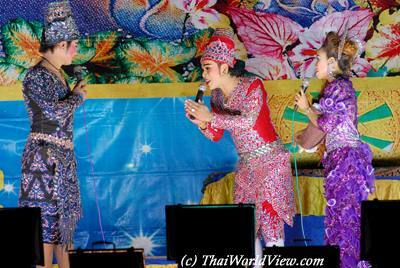 Likay is a famous folk-art performance in Thailand. It dates back to the late 19th century. 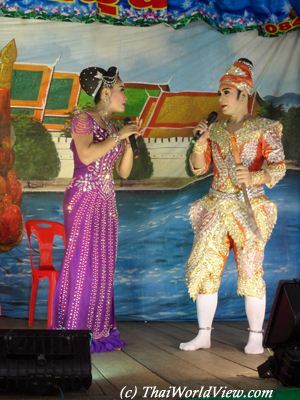 Folk opera known as Likay has become rare in Bangkok over recent years. 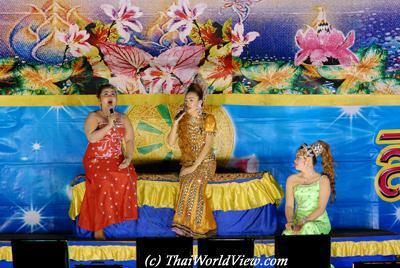 It is still very popular in central Thailand, with troupes staging regular performances in front of big audiences. Nowadays modern Likay troupes feature LED display and also surround sound system. Most Likay troupes have a repertoire of more than 40 tales often adapted from the Indian traditional stories. 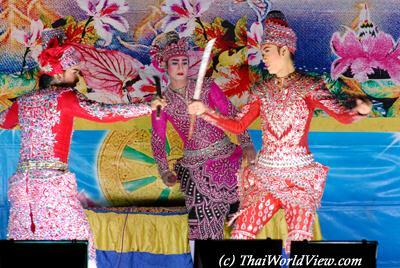 Over the decades, Likay, has evolved but it has never lost its unique Thainess thanks to impromptu verse, fast-paced action, sparkling costumes. Normally Likay performances happen on a stage but in some private events such as ordination ceremonies, troupe could perform on the ground.